Want to make these at home? 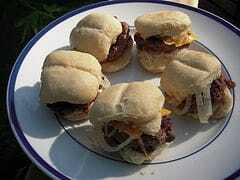 We will show you our copy cat recipe for making these mini sirloin burgers at home. These are simple to make, and would be great at a tailgate party, a sleep over, or make a stack of these for an evening staying in watching moves. We used bake and serve rolls for the buns here, because this is a small roll we all have access to, now if your store or local bakery makes a different type of roll, you may want to use those. These burgers are made with ground sirloin, American cheese, a tangy pickle, sweet ketchup, and grilled onions. You can still make the now removed from the menu item, Mini Sirloin burgers from Jack in the Box. Combine ground sirloin, seasoned salt, and ground pepper. Mix well. Slice onion thinly and place into a skillet with peanut oil. Grill onions slowly, do not brown onions. When the onions are almost translucent make 6 to 8 hamburger patties, make them thick (approximately 1/2 inch), and place into hot pan. Grill hamburgers for 4 to 5 minutes before turning them. Flip hamburgers, and remove onions. When hamburger patties are done assemble them with. Bottom bun, pickle, meat patty, cheese, grilled onions, and then ketchup. Serve quickly. We imagine you will find these tasty. I made these for my last cookout, everyone enjoyed them.